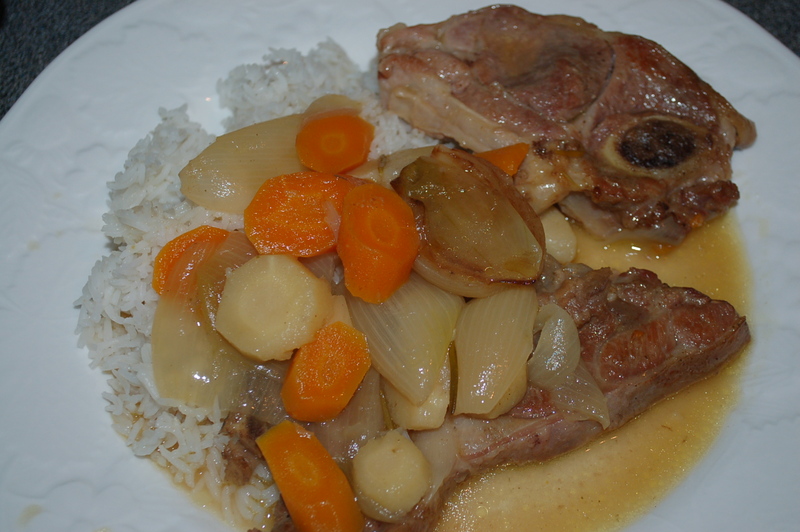 lamb | Crappy Kitchen - Good Dinners! They say that self-praise is no-praise, but I have to pat myself on the back for this gem of a dish (pat, pat)! I wanted to make something splendid. My friend Bird was in from New York, and each day had to be full of fun adventures, and fabulous food each evening. I took this dinner to my friend Tom’s house, and it became part of an even larger affair, with 4 different kinds of pizzas, cheese plates, and other side dishes too numerous to mention. I thought after about 2 months of doing this blog, the food would run out. Now I find I cannot keep up with the amount of dishes to be documented and talked about. I will have to leave the pizza for another day, and give it the spot in this diary that it deserves. Suffice is to say, I waddled home very contentedly. 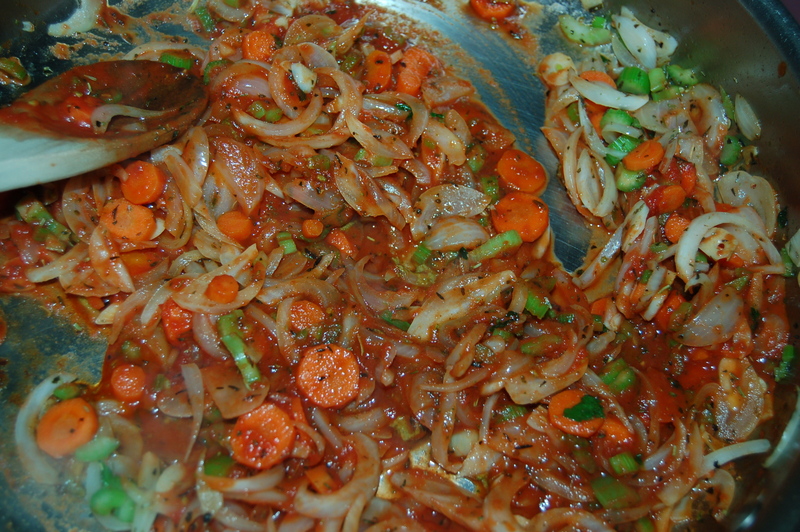 1 – Put pot of water on high heat and when it comes to a boil, add the onions. cover and cook for 5 minutes. Drain, and, when cool enough to handle, remove the skins. You do this by cutting the end where it grew from and then squeezing until the onion pops out of the skin. 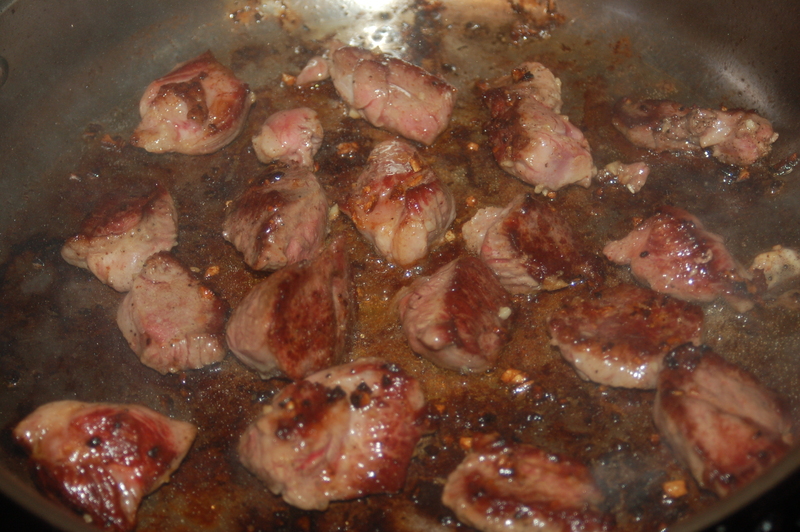 3 – Put big saute pan or heavy casserole on high heat and add half of the oil. 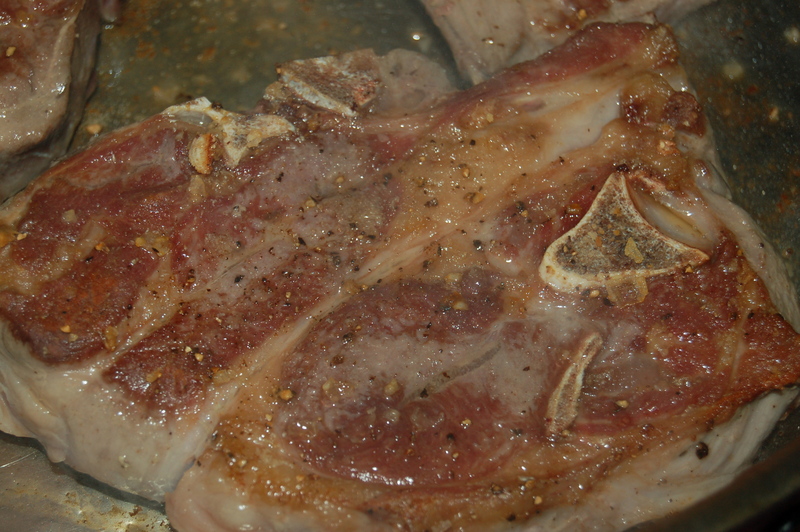 When it is slightly smoking, add the meat and sear on both sides until brown. You will need to do this in batches and add more oil as you go. Transfer to a plate and set aside. 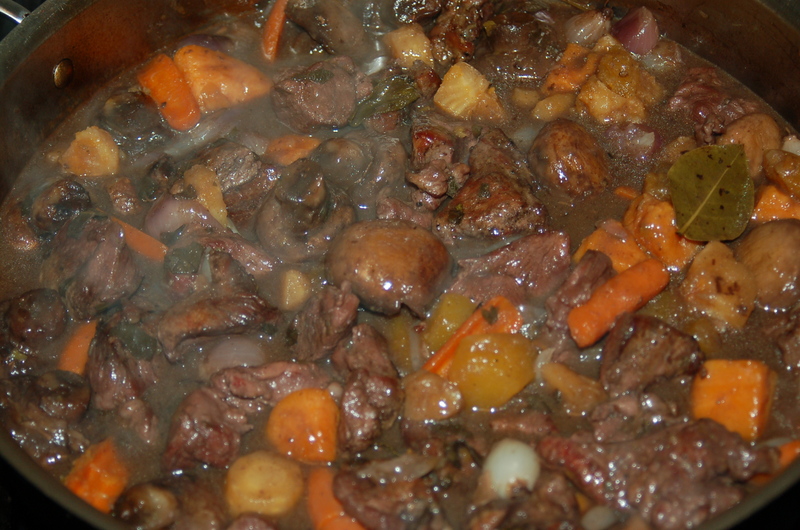 4 – Turn heat down to medium and add more oil if necessary. 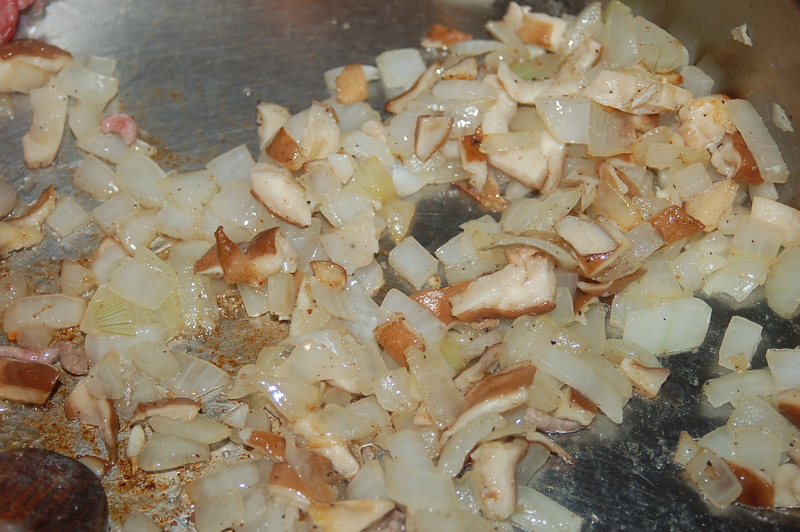 Add the mushrooms and onions to the pan and saute for 10 minutes. 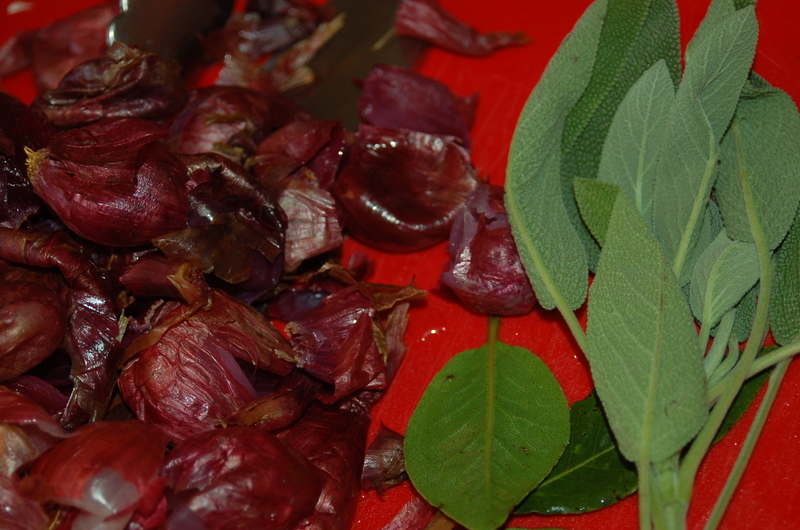 Add the crumbled bouillon, sage sprig, and flour, and mix into the vegetables. Add the red wine and water and turn heat up. 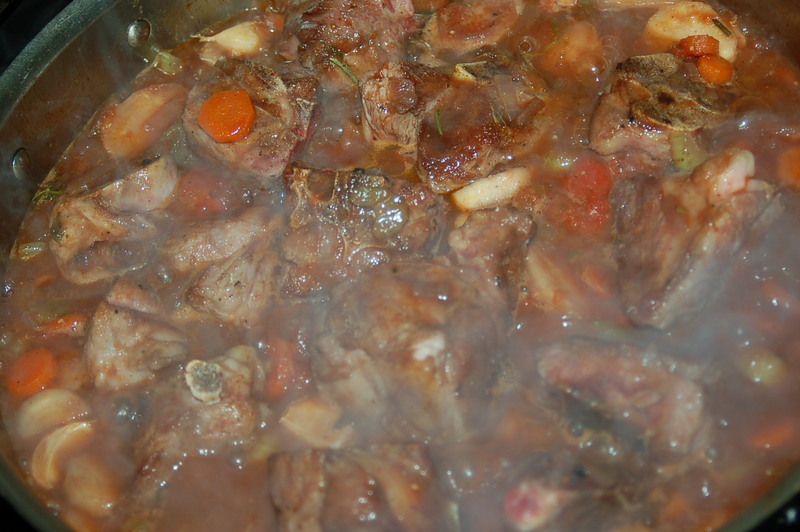 Stir until liquid reaches a simmer and then add the lamb back to the pan. 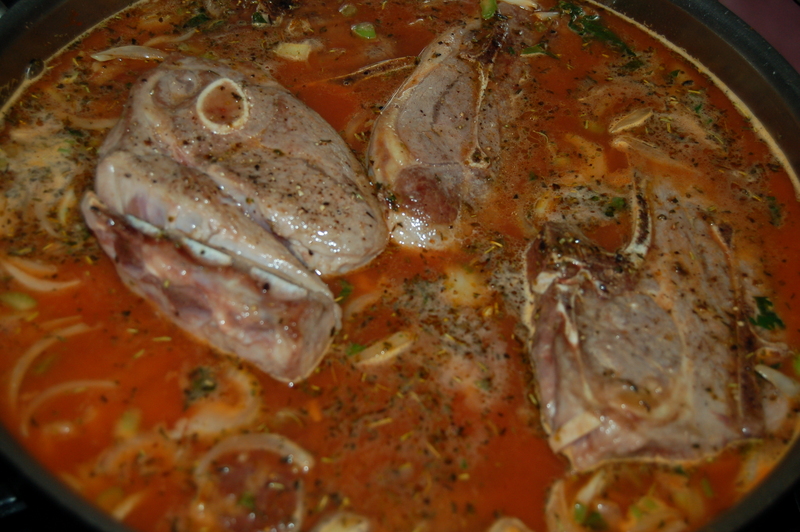 5 – Cover pan and place in preheated oven for 1 1/4 hours. Take out of oven and test meat by piercing with a knife. 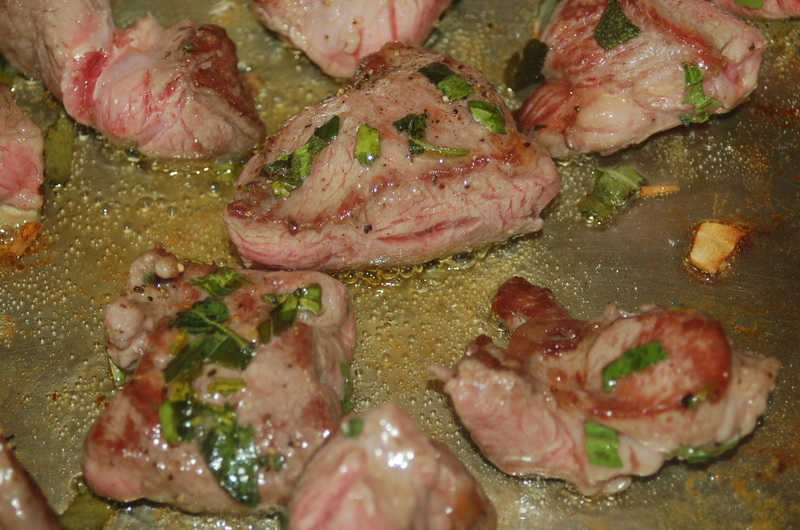 If it goes through very easily,the meat is cooked. 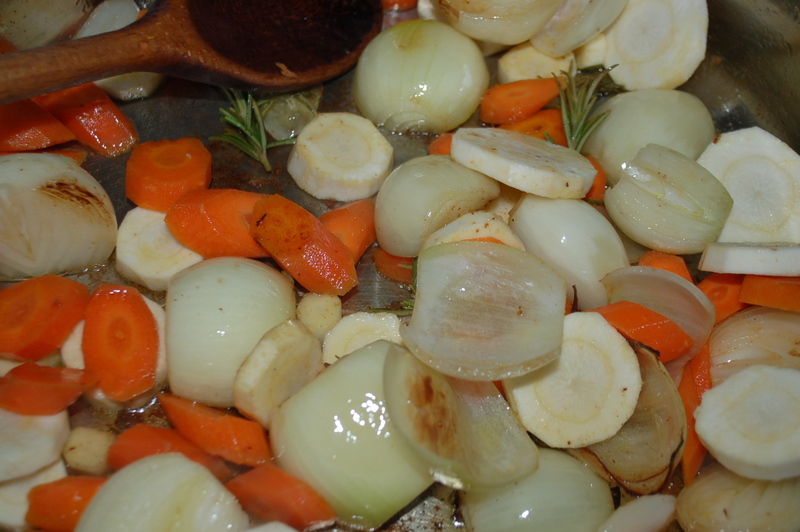 6 – The moment you take the dish out of the oven, remove the lid and add the cooked root vegetables. 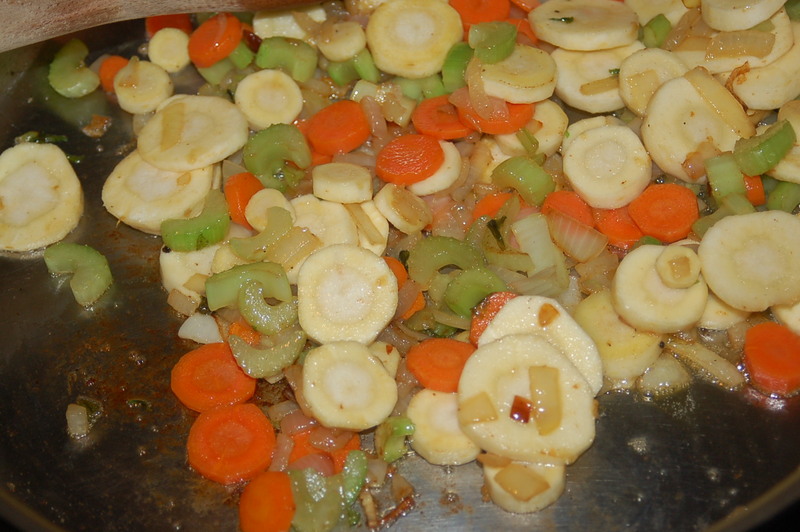 Cover and let it sit for 10 to 15 minutes to let the veggies warm up. Serve as is, or with mash, rice, pasta, bread or a salad. All I can say is, be prepared to fight over the last scraps in the pan! This was a truly wonderful lamb dish. 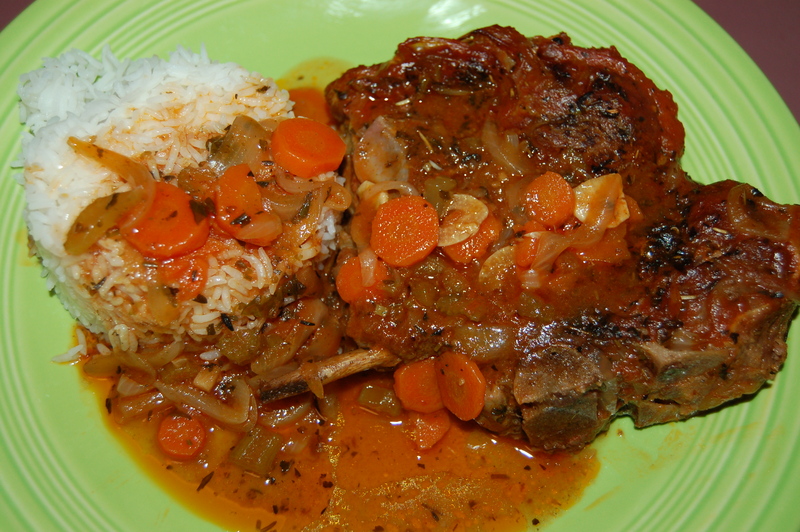 If you like lamb well-enough, you will love it after trying this! 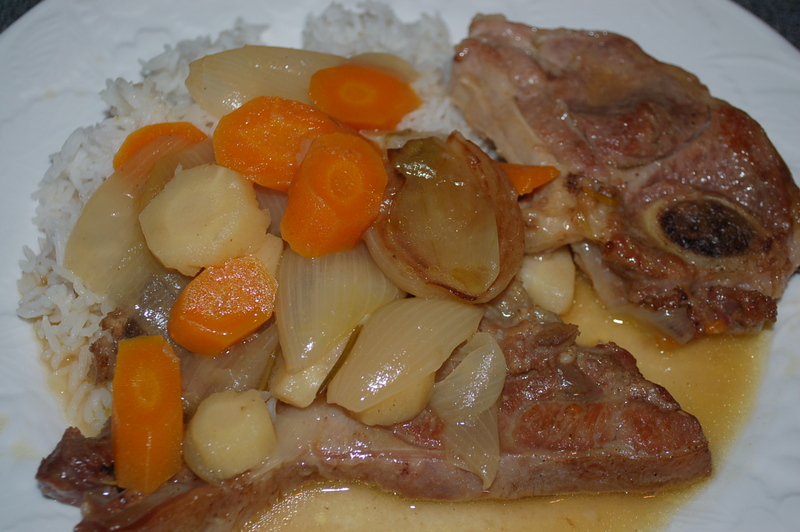 Truly a great lamb dinner! This dish came about because I wanted something fabulous to go with some morel mushrooms my friend Tom had found in the woods by his house. I got a phone call to tell me the news and I was so excited that I bought some expensive meat and some cream to make a rich sauce for the morels to languish in! Anyway to make a long story short, I did not end up using them in this dish for one reason or another, and, that may be a good thing. (I am writing a post about my morels next!). 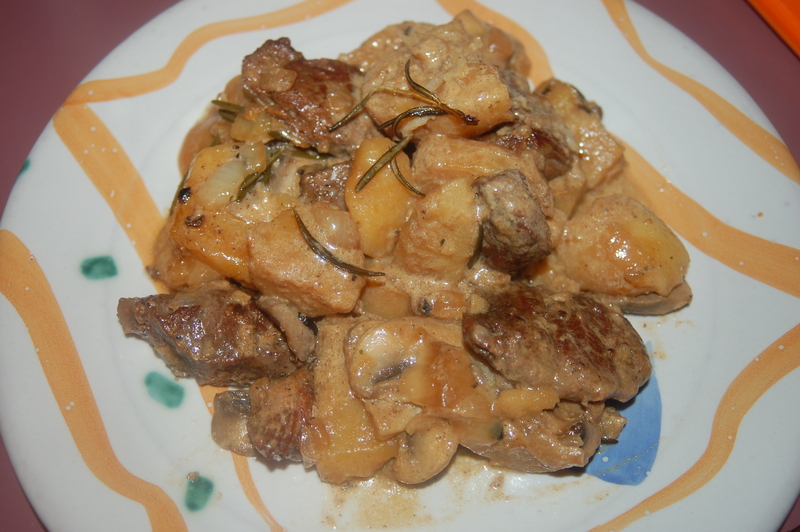 If I had used them instead of the ordinary white button mushrooms you would perhaps never have had an opportunity to try this recipe (being that they are difficult to come by and cost an obscene amount of money). That would be a great tragedy as I actual don’t see how this dish could have turned out better! 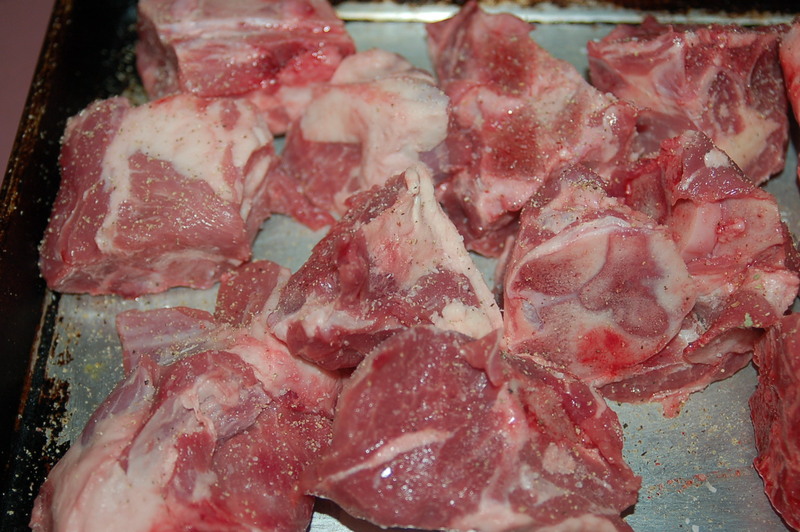 You will need: 2 1/2 lbs lamb shoulder, cut into big chunks (you may be able to find it already cut. 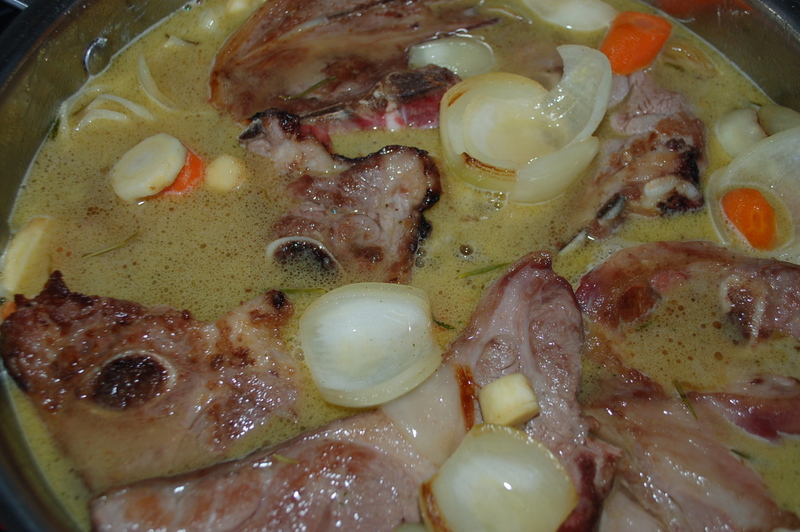 It will be marked “stewing lamb”), 3 tbs olive oil, 1 medium sweet onion, diced, 8 medium yellow, white or red potatoes, cut in half, 4 garlic cloves, finely chopped, 8 oz white mushrooms, sliced, 2 sprigs fresh rosemary, left whole, 1 vegetable stock cube, 1 cup heavy cream, 1 cup water, coarse sea-salt, freshly ground black pepper. 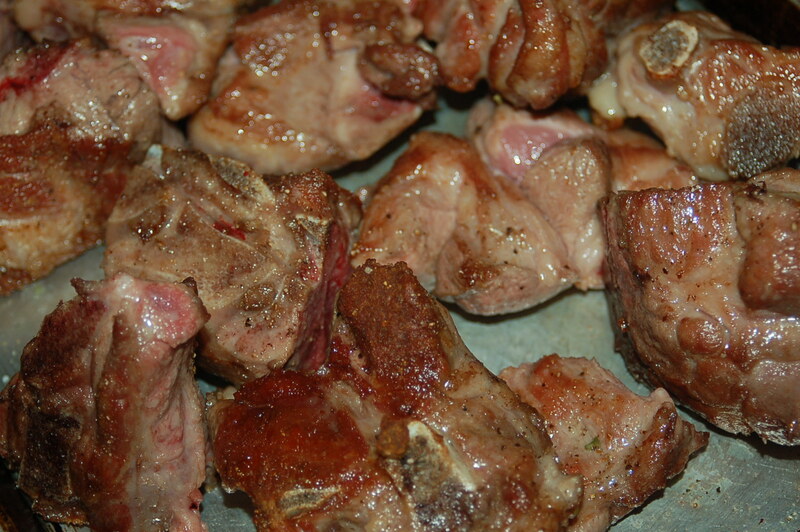 Seasoned lamb ready for searing..
1 – Put lamb chunks in big bowl and season with 1 1/2 tsp coarse salt (if your salt is not coarse just add 1 tsp), several good grinds of pepper and the chopped garlic. Mix everything together. Set aside until ready to sear. 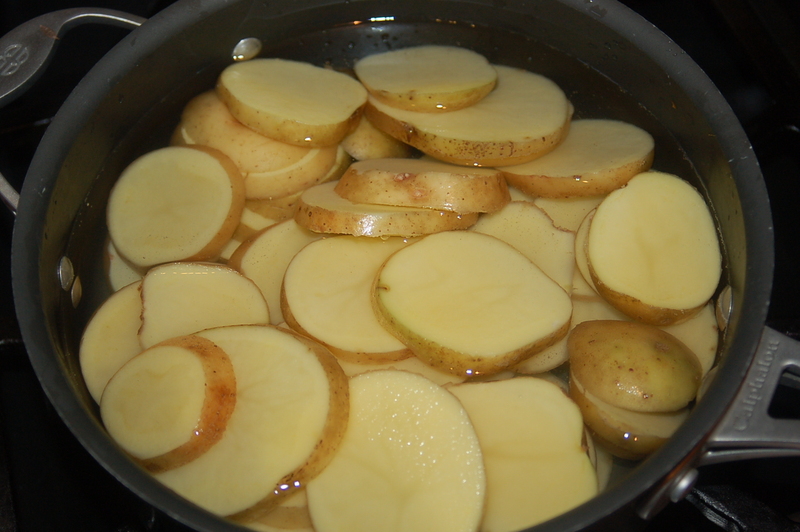 2 – Put halved potatoes in pot and cover with cold water. 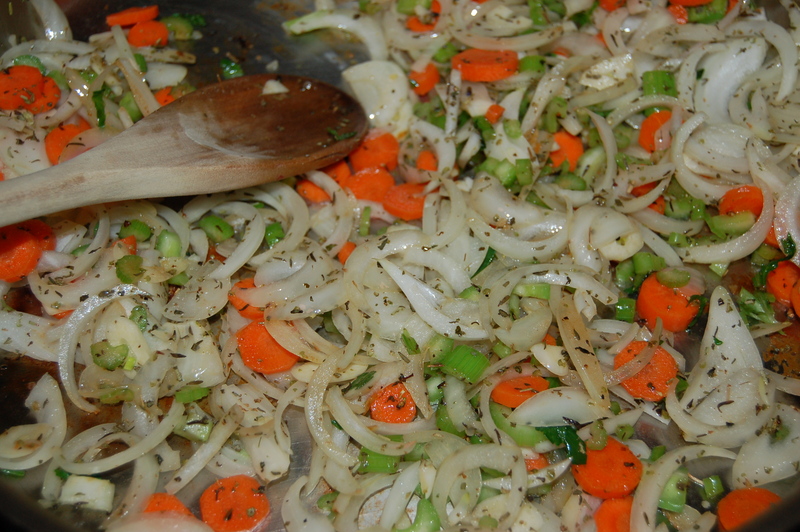 Place on stove top with lid and when it comes to a boil, time for 10 minutes. The will still be undercooked, but not hard. Drain in colander. When the are cool enough to handle (you can be doing other tasks like chopping onions and mushrooms or searing lamb?) peel, slice thickly and set aside. 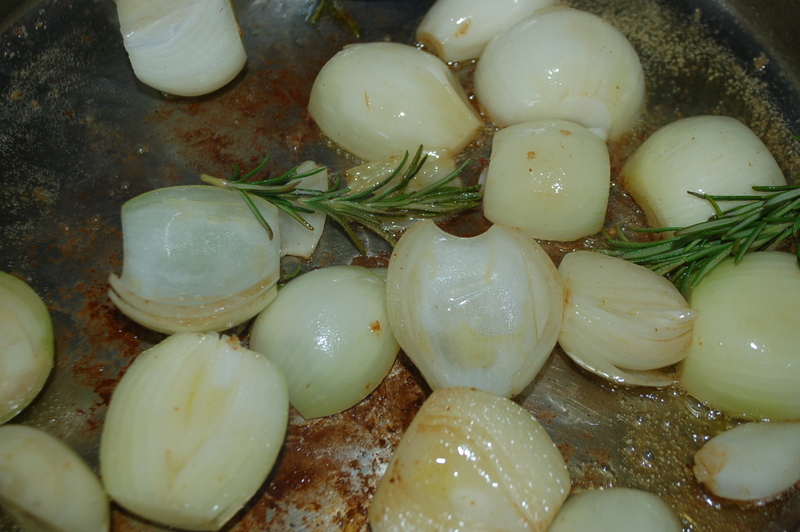 saute onions, garlic, rosemary and bouillon cube..
4 – When meat is done, turn heat down and cook the onions for 5 minutes. 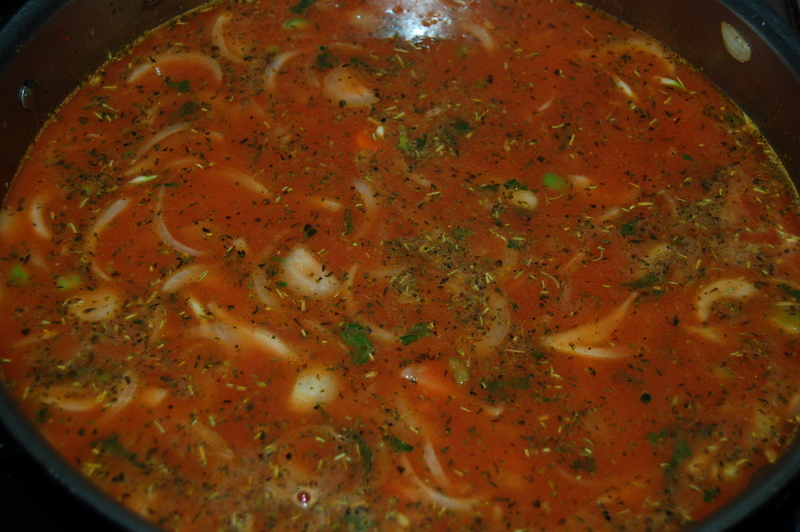 Add garlic, bouillon cube and rosemary sprigs and continue to cook for another 2 minutes. 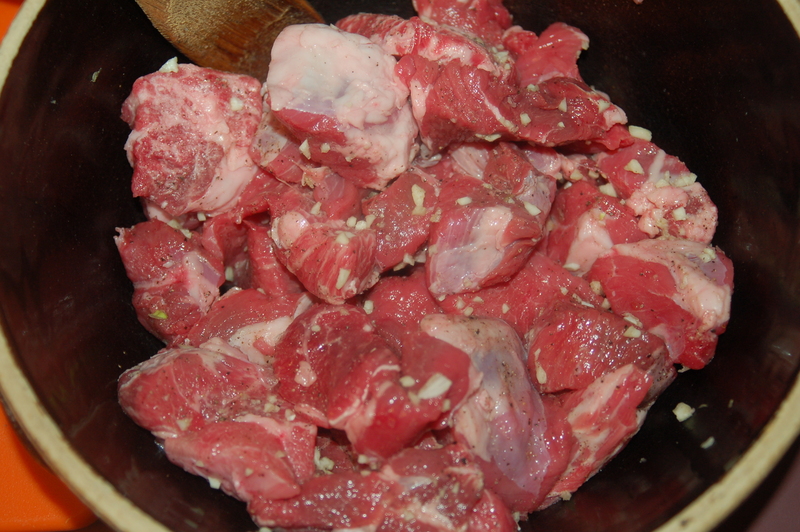 5 – Add the cream and water and stir. Continue to cook until it comes to a simmer. Turn off pan. Assemble casserole: In heavy casserole pot rub about 1/2 tbs unsalted butter inside pot. 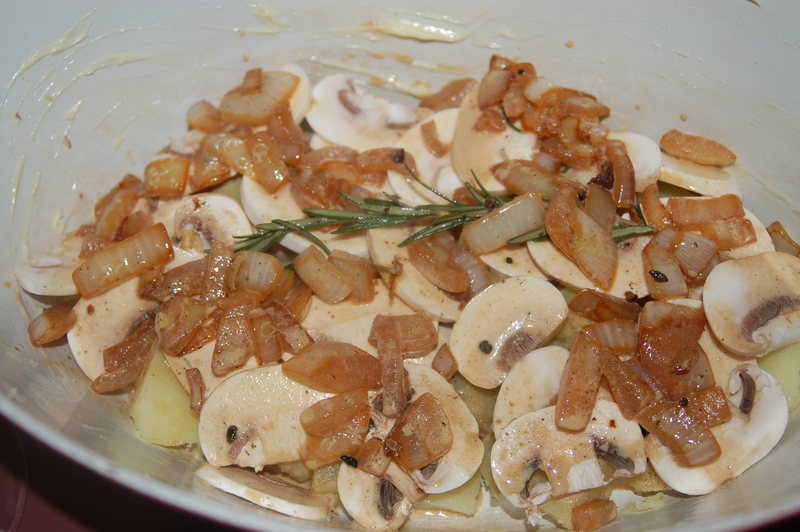 Layer 1/2 of the potatoes on the bottom, followed by 1/2 of the raw sliced mushrooms. 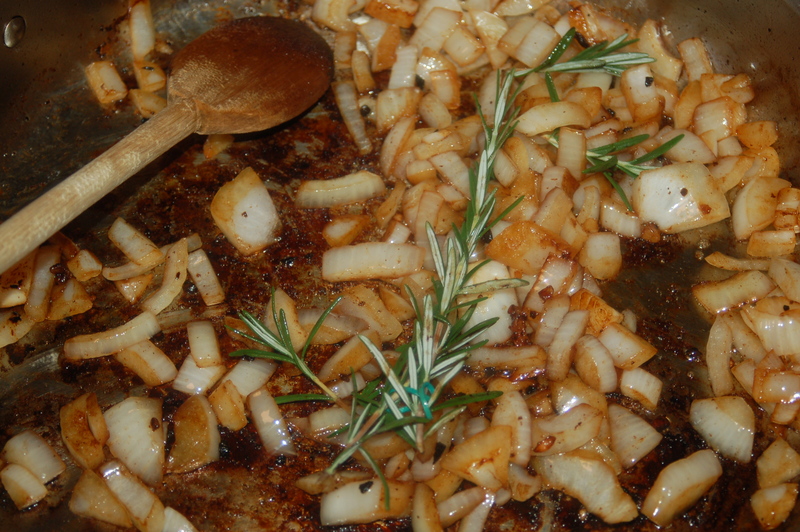 Add 1 cup of sauce from pan, along with a nice portion of the onion mixture and 1 of the rosemary sprigs. 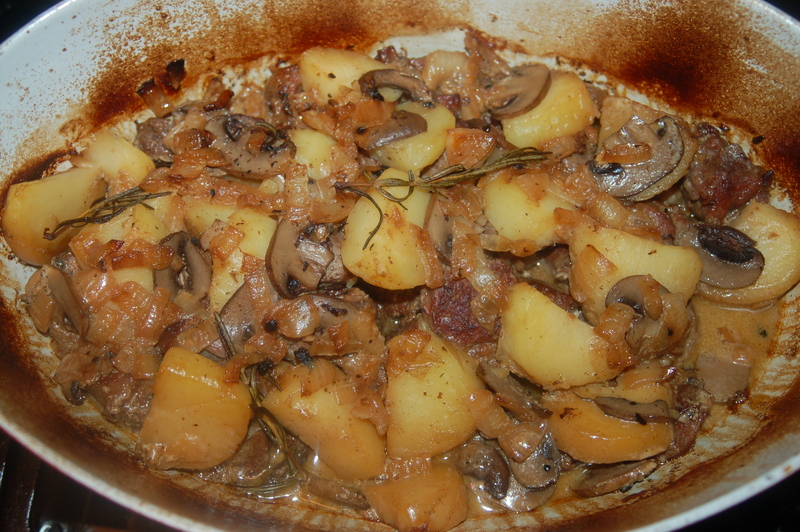 Layer potatoes, mushrooms, sauce, onions and rosemary sprig..
Next add all the lamb, followed by potatoes, mushrooms and the rest of the sauce. Cover and place in oven for 1 1/2 hours. 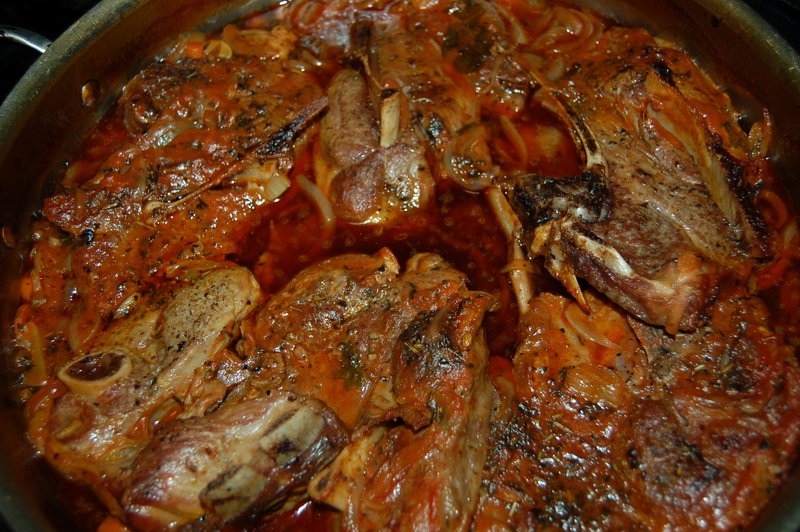 The sauce was perfect with the lamb.. It was St. Patrick’s Day yesterday and being Irish and away from home I felt no obligation to cook something “Irish” for our dinner. My sister (who is in Ireland) teased me about making sure I made a “good old Irish Dinner” – she was joking of course. We just don’t think about St. Patrick’s day in that way! Having said that, yesterday, as I was peering into the freezer and deciding on dinner I spied some minced lamb and I couldn’t help feeling a little sentimental and so I pulled it out. Prehaps it was because every second person that I saw was wearing something green (or when driving down town someone was sporting the sign “honk if you’re Irish”)? 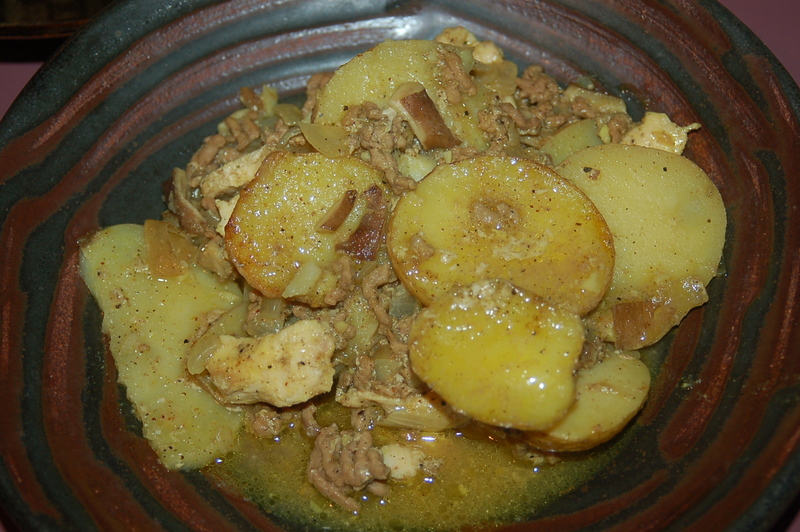 I ended up making a dinner that included lamb and potatoes, but, the dish also had chicken and curry flavors. I though the curry would be great with the lamb. I wanted it to be a “dirty only 1 pot” meal so I combined everything into a make-shift scalloped pie. This is something I will certainly make again – no matter what day it is. 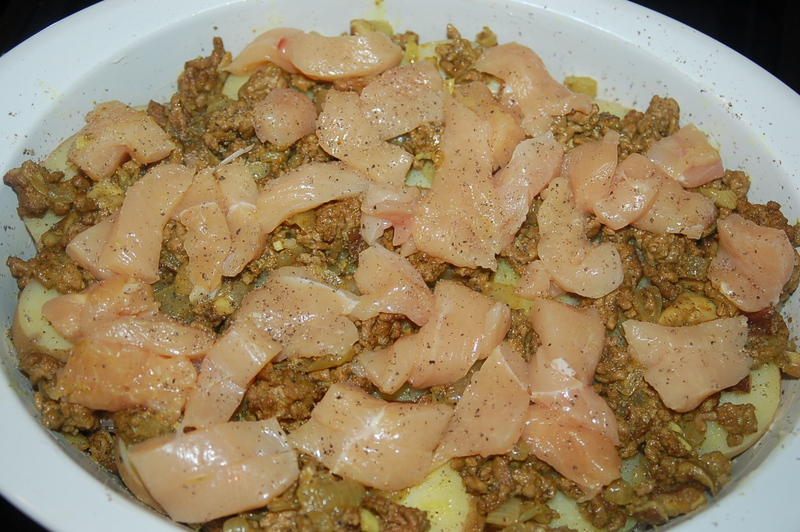 You will need: 1 lb minced lamb, 1 lb boneless skinless chicken breast, 1 big sweet onion, 3 cloves garlic, 3 or 4 oz shiitake mushrooms, 8 medium potatoes, 1 tbs curry powder, 2 tbs flour, 3 tbs unsalted butter, 2 cups chicken broth, freshly ground black pepper & salt for seasoning. Boil potato slices for 6 minutes. 1 – Wash potatoes and cut into slices (about 1/4″ or just over 1cm) and place in pot and fill with water until just covered. Put lid on and place on high heat on stove-top. When the water comes to a boil, time for 6 minutes (you may have to turn the heat down slightly to avoid the lid hopping up and down off of your pot!). Drain into colander and let the potatoes sit until you need them. 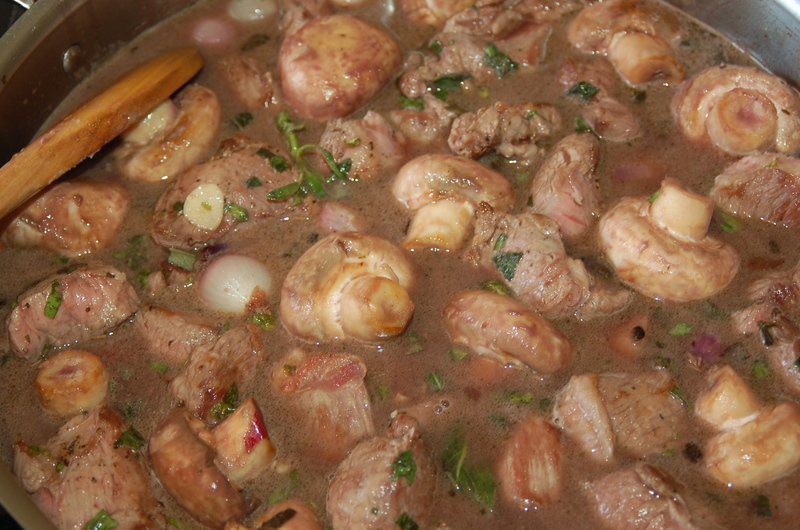 saute onions and shiitake and garlic before adding lamb. 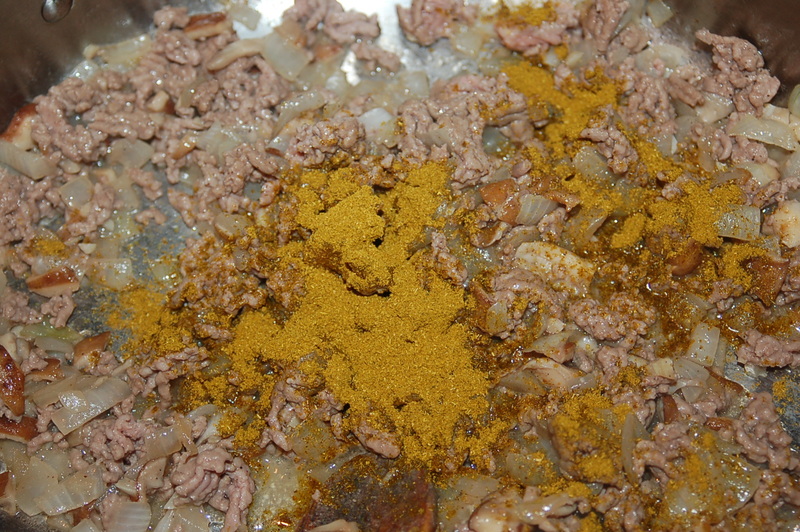 Add curry powder to lamb mixture..
3 – When meat has browned, add curry powder and mix. Add flour and mix and cook for about 2 minutes to allow the flour to cook. 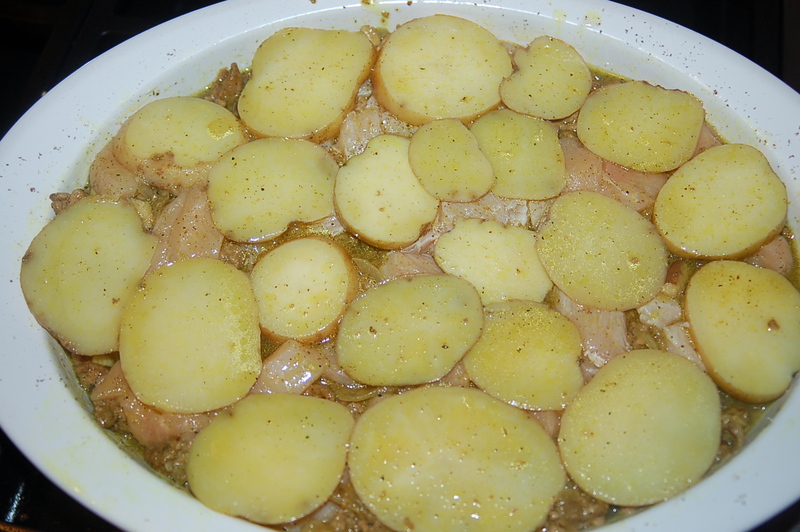 assemble - potato, lamb, chicken & repeat..
4 – Chop the chicken into small chunks. 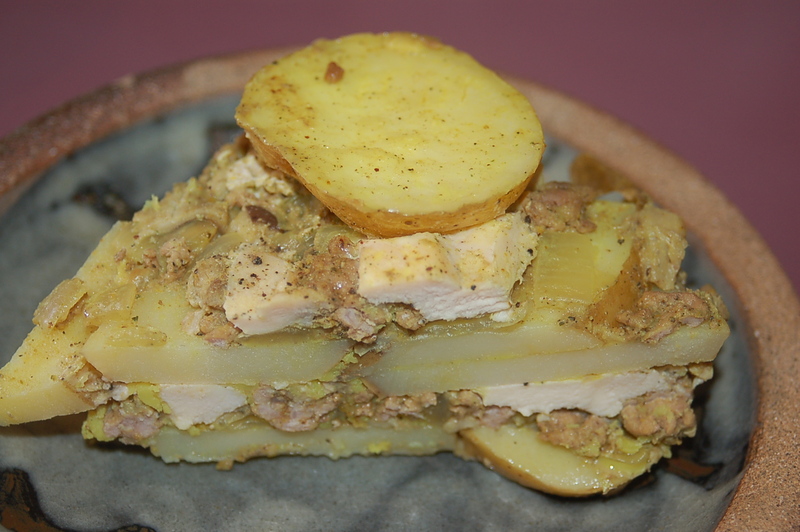 End with potato layer and then pour broth into dish..
5 – Grease a casserole dish with butter and add a single layer of potatoes. 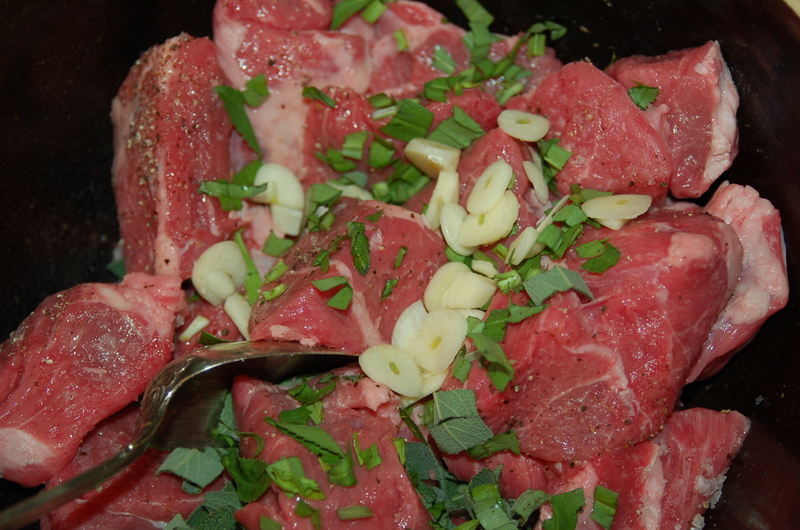 Spoon 1/2 of the lamb mixture on top followed by 1/2 of the chicken and a grind of black pepper and a little salt. 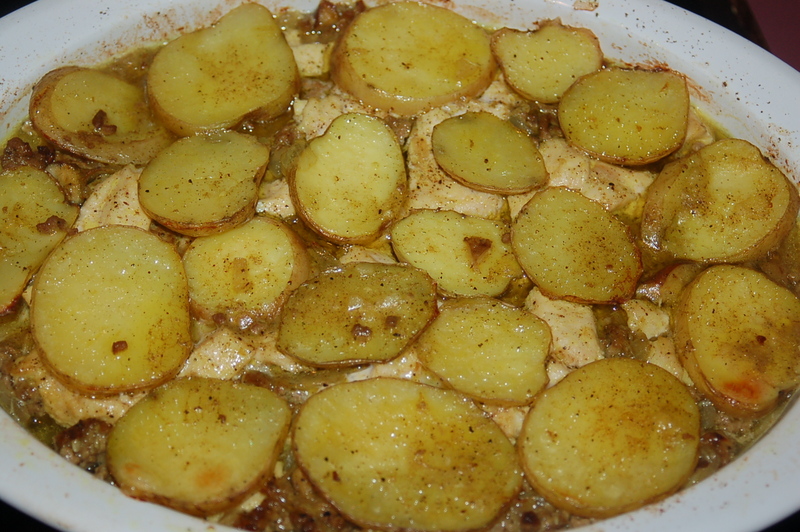 Add another layer of potatoes, lamb and chicken and end with a layer of potatoes. Pour broth into dish and press everything down with your hands until the broth covers everything. 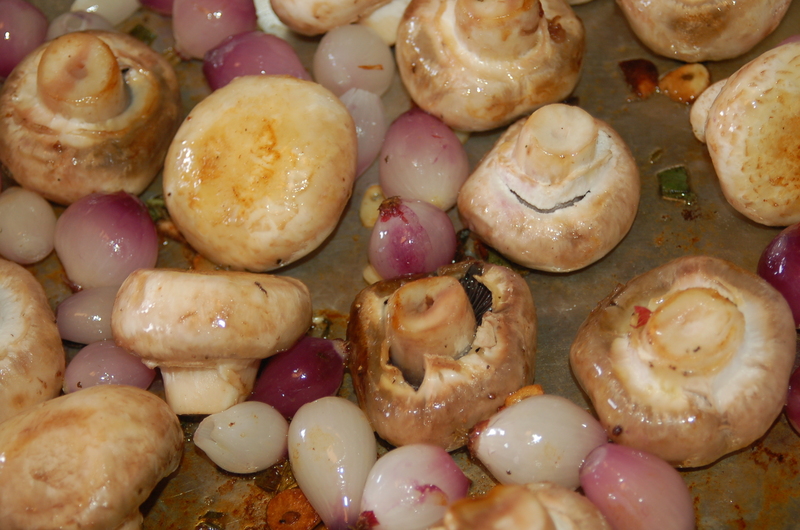 Place in preheated oven for 50 minutes. We had this with a fresh green salad. The leftovers also made a great lunch. It was a freezing cold day so tonight’s dinner had to be primitive. It had to be something you would cook if your house was devoid of heat and your dinner was going to be the only thing to keep you warm in your bed at night. Our big blanket came this evening in the form of lamb. 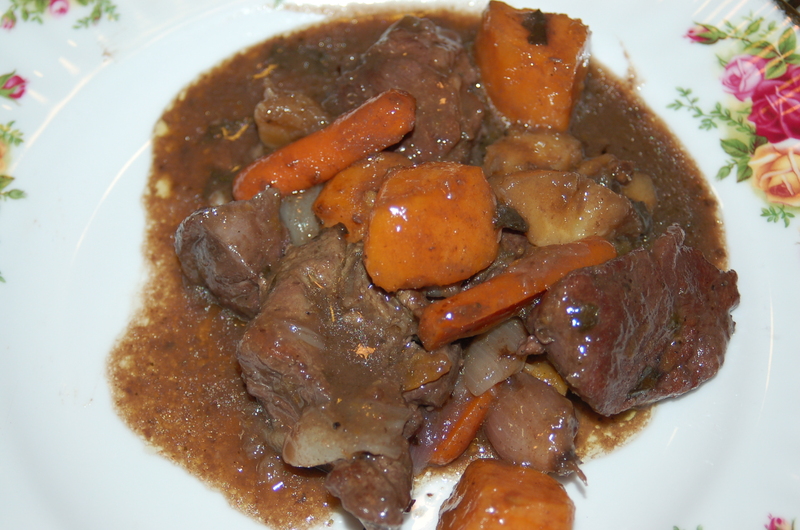 Nothing warms better than a steaming bowl of syrupy lamb stew. 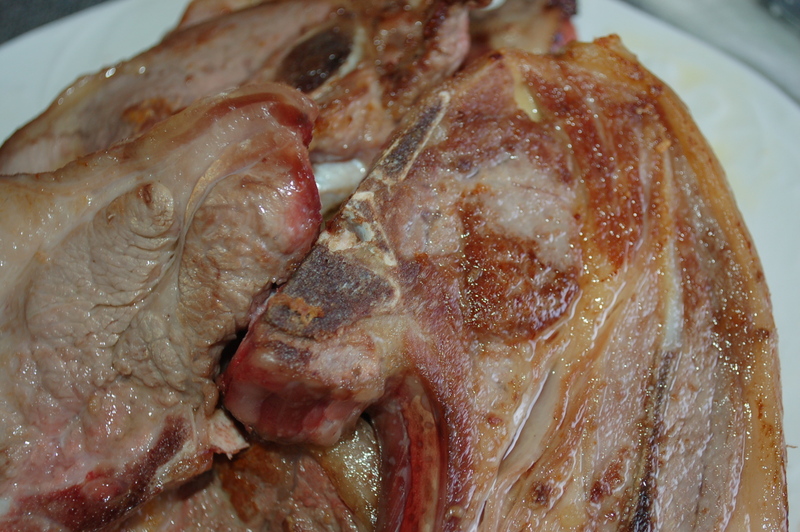 I know lots of people who cringe when I talk about lamb for dinner. They find it too intense a taste. For me it is a food that I grew up eating. 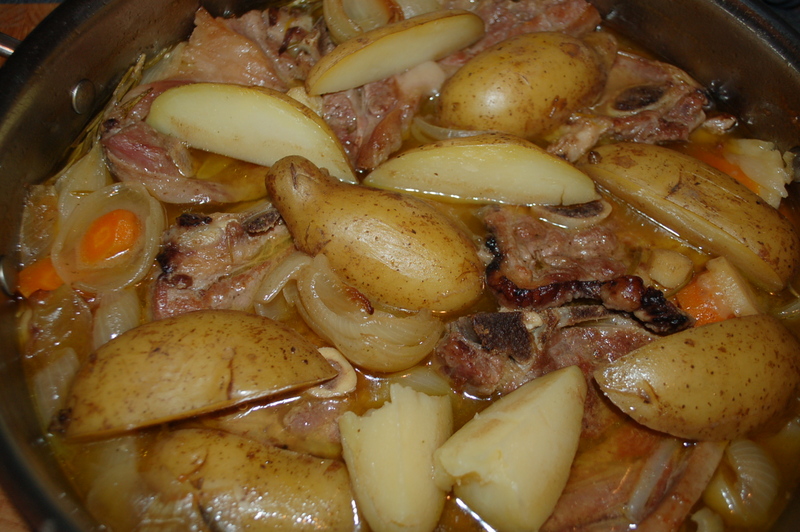 It was a once a week offering and came in a big pot with lots of potatoes bobbing in the stew broth. I have been conditioned to believe that it is the medicine for cold nights (well that and a hot water bottle!) and my job is to pass that message onto my children. It takes a bit of time to cook so get it into the oven as soon as you can. 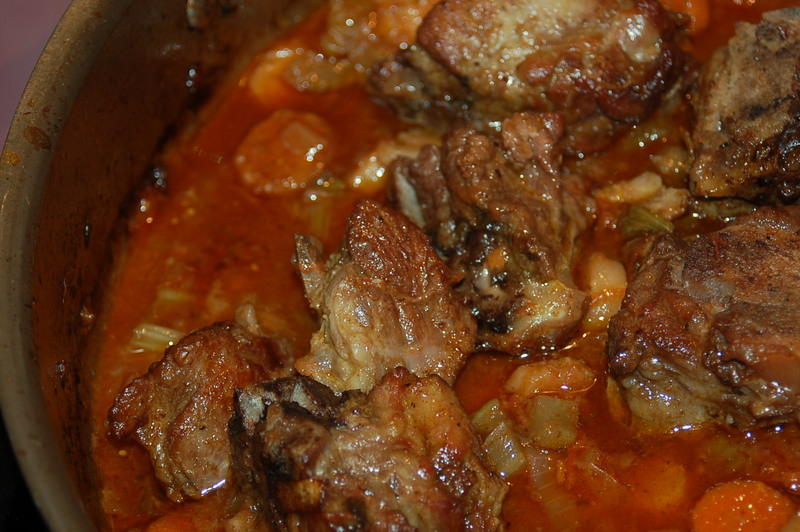 You will need: 3 lbs lamb shoulder, 8 cloves garlic (separated but left in skins), 3 carrots, 3 parsnips, 2 celery stalks, 1 140z can whole peeled Roma tomatoes & juice, 1 onion, 1 cup red wine, 3 cups vegetable stock or chicken stock OR 3 cups water and 1 bouillon cube (chicken or vegetable), 1 tbs chopped fresh rosemary, salt and freshly ground pepper. 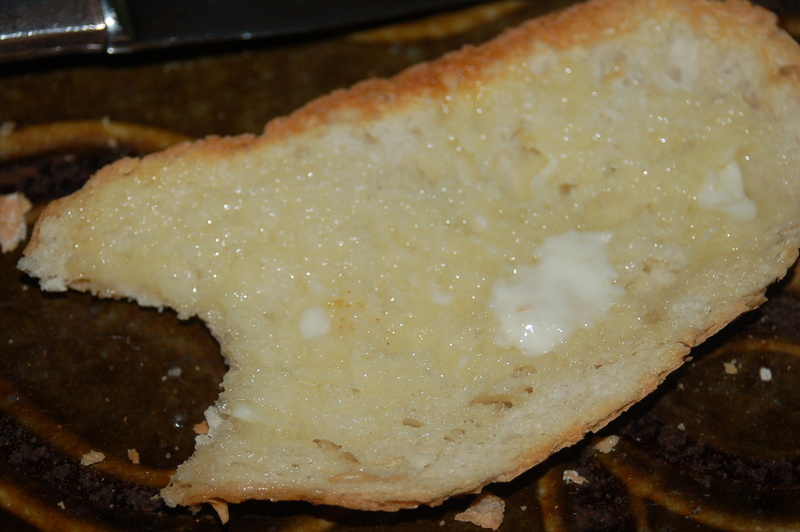 eat bread and butter to stave off hunger..
another 1/2 hour. Take it out and let it sit covered for 10 minutes. 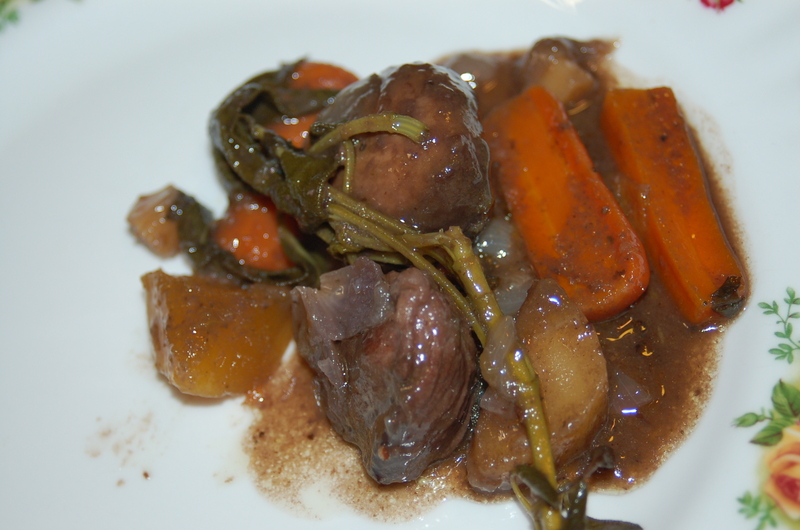 Serve with some baby steamed potatoes (or rice) and some greens. Sometimes a big loaf of bread is all you may feel like……pretty easy dinner to put together.